This post was originally published on January 21, 2015 and republished on January 21, 2017 with updated content and photos. 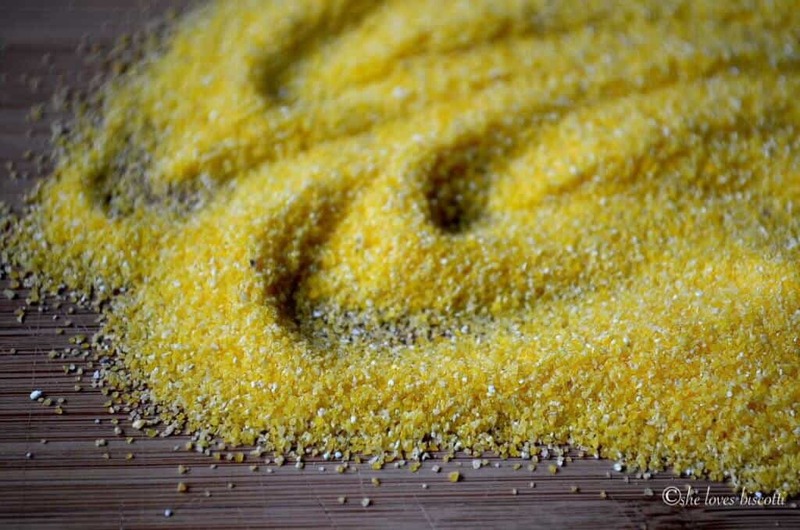 I have a confession to make… I love polenta. I’m not even picky about how it’s prepared. Without a doubt it is definitely one of my top five comfort foods. I love it “mushy”; I love it sliced; I love it on the bbq (if interested, here is one of my go-to recipes: Easy Garlicky Grilled Polenta); I love the texture cornmeal provides in bread, muffins, cookies, cakes and I even used cornmeal to make these Lemon Blueberry Scones! 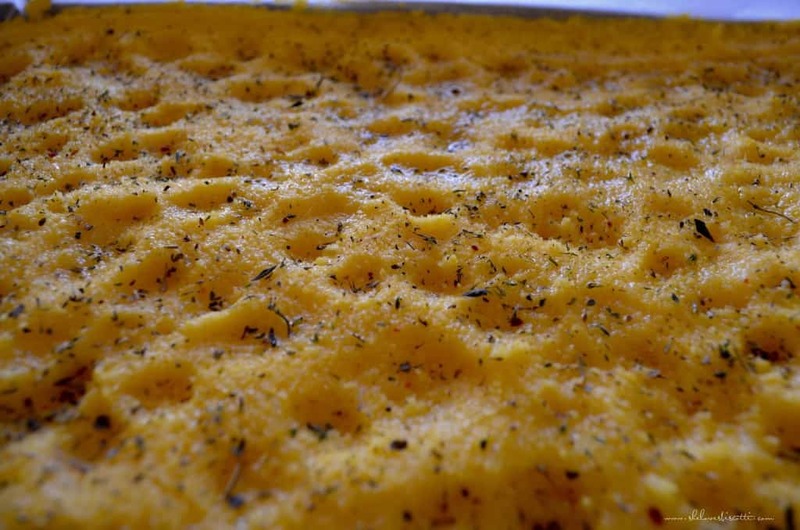 I could go on, but I think you get the picture… I just love polenta. 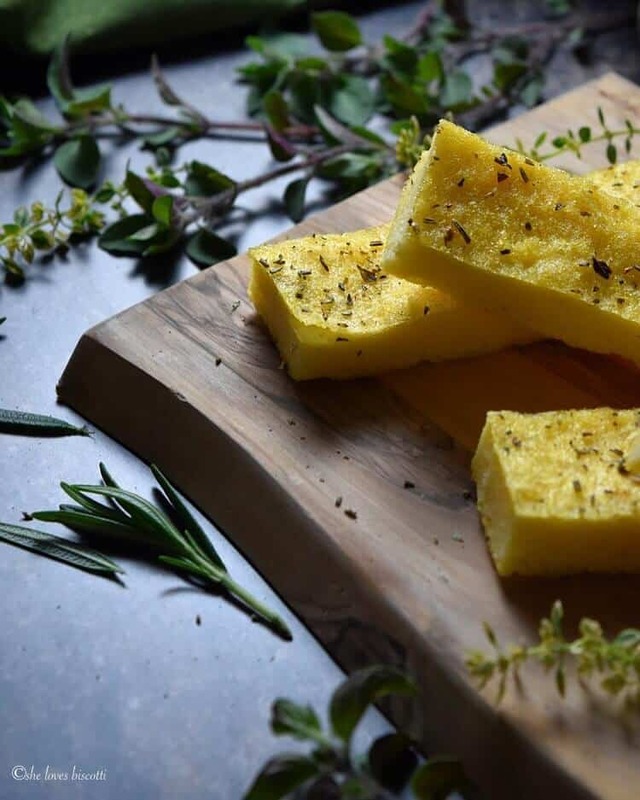 But what exactly is polenta? 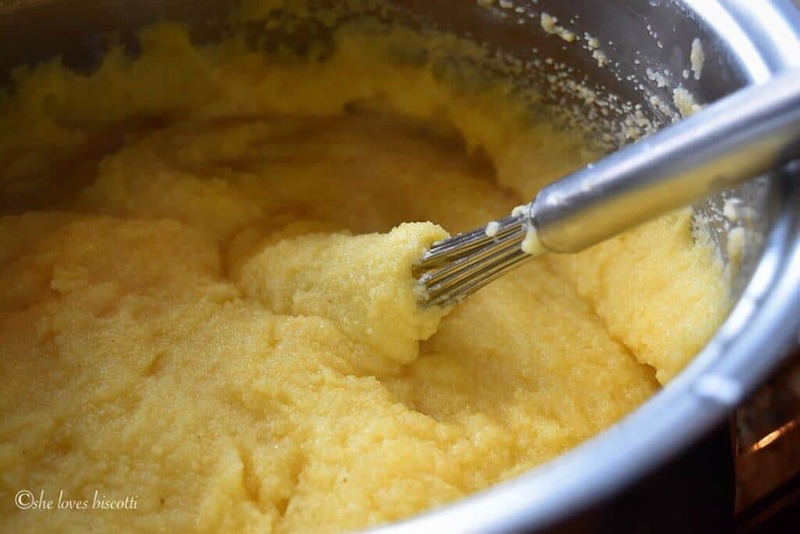 Polenta refers to a dish which is made when you add water (or some other form of liquid, like milk or broth) to cornmeal and cook it (stove top) on low heat for 35 to 45 minutes. That’s it. Do yourself a favor and do not cheat yourself from a smooth, silky polenta. You have to commit to at least 35 minutes of cooking and stirring (I will share my recipe soon…). 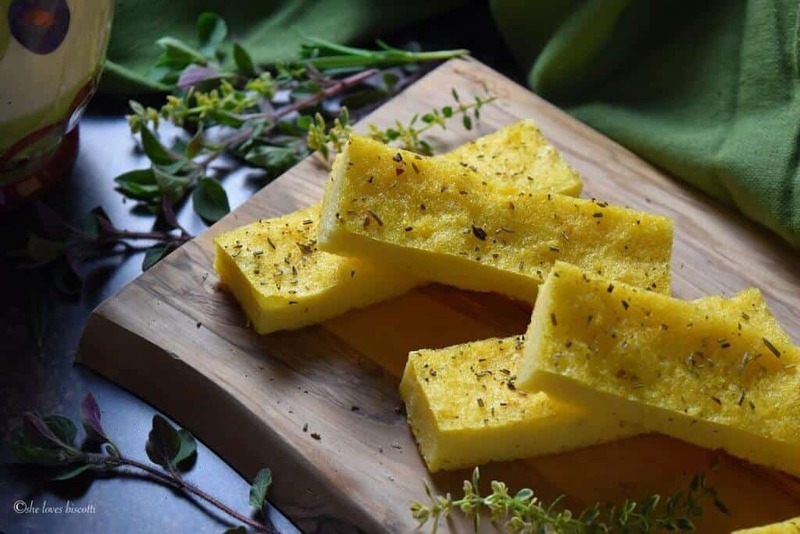 Did you know that polenta was once considered a poor man’s food? Today, it can be found on the menu of all the trendy restaurants. It’s great to use as a base for almost anything from sautéed vegetables to stews. 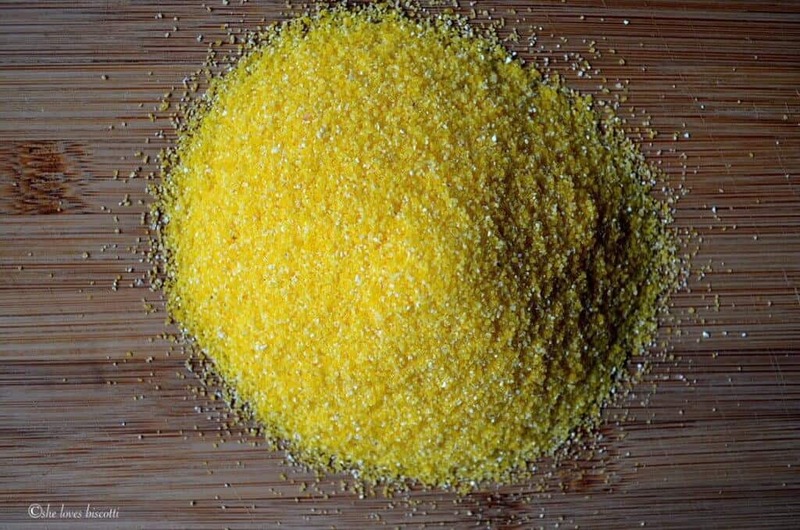 As you probably already know, cornmeal is a type of flour that comes from ground corn. Depending on the type of corn which is used, the colour can be yellow or white; the texture can also vary from fine to coarse. For this recipe, we will be using equal amounts of fine and coarse cornmeal. Once your pot of water begins to boil, add the salt and olive oil. Reduce heat to the lowest setting and slowly whisk in the cornmeal. Continue to whisk for about 5 minutes or so. You will notice that the polenta mixture will quickly begin to thicken. Carefully transfer the polenta to a sheet pan as we will be baking it in the oven for about an hour. Recently, my husband bought me a thick cast aluminum oven safe plaque. 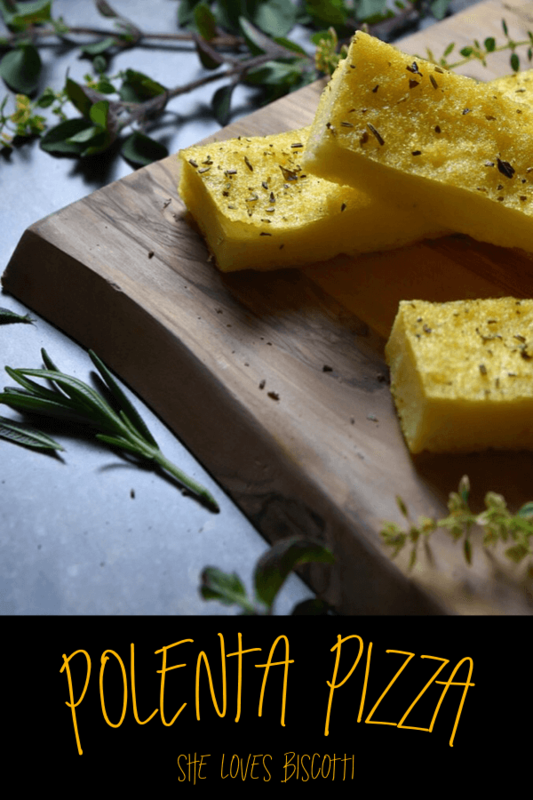 This polenta pizza comes out perfect every single time. In case you are wondering, he bought the plaque at Costco (not sponsored). Your polenta pizza can be of any thickness you wish – just spread it out on the sheet pan however thickly you prefer. I usually make one end thin and the other end thicker… that way, everyone is happy. I usually dampen my hands with water and then pat down the polenta to the right thickness; sprinkle whatever herbs I have and pop it in a hot oven. The polenta “pizza” eventually forms a bottom and top crust, while the middle part becomes soft and creamy. 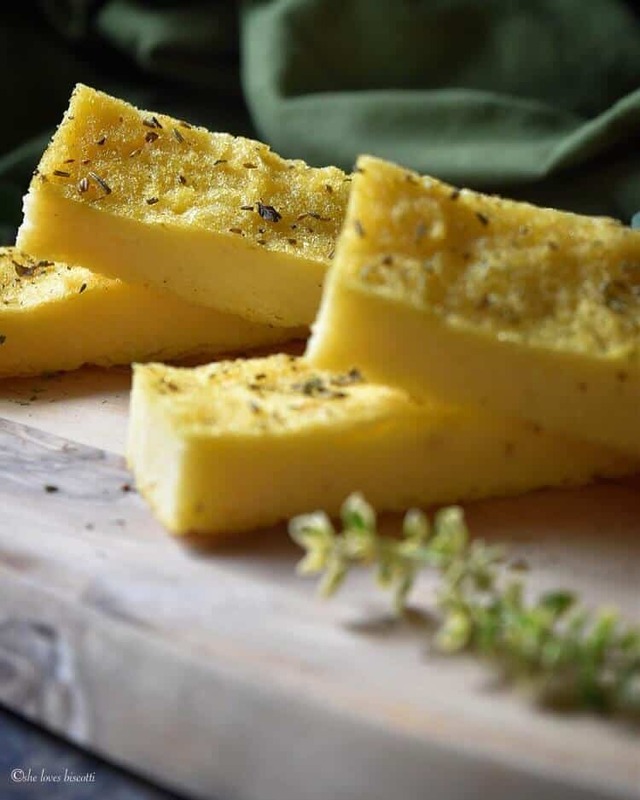 Polenta was a staple when I was growing up, and my mom would often prepare this Creamy Polenta Recipe. Sunday nights were reserved for polenta pizza, which we referred to as Pizza di Randinie. Simple to prepare and yet full of flavor. This rustic polenta pizza with herbs is one example of the sort of stuff she’d come up with. I prefer the texture obtained by mixing coarse and fine cornmeal. Experiment and see for yourself how different your pizza can be by using different cornmeal textures. You can try topping this polenta pizza with cheese, tomato sauce, Swiss Chard, caramelized onions, Marinated Roasted Red Peppers – anything you would top a regular pizza with, really! This basic recipe truly has endless possibilities. What will you top this pizza with? His exact words, “mamma Mia this is so good . You even cut it in squares for me to grab a piece. Even good cold.” Wish he would make a comment to you. He is so comical. Thank you so much. Absolutely priceless ♥ Thanks so much Jane. Have a wonderful evening. I just cut the polanta. It shrunk down a little in the oven forming this delightful crust on top. The taste ..wonderful. I layered the squares with plastic wrap between and I can not wait to hear what they say. I know he will say, “mom you really invented something this time!” Hmmmm should I tell him….yes I already told him about your wonderful website. You gave me a “Light bulb moment!” I make polanta with seasonings and after it is done I put fried diced peppers grated imported cheese etc and put it into a loaf pan for my son to slice and brown. Sometimes it falls apart. Today I spread it in a large greased pan about 1/2 inch thick and baked it. It smelled Devine. It is cooling now. I am sure it will cut nicely and his family will love it. You are a gem to unselfishly share these wonderful recipes. Thank you. 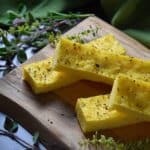 I’m a polenta fanatic too! !